The Saanen goats, coming from French lineage are the basis of Capril da Agro Maripá. 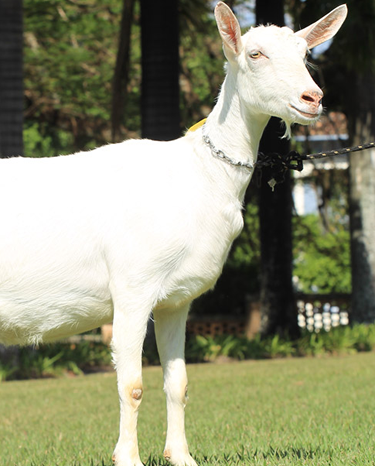 With average production per goat of 4.0 kg of milk, the goat herd has breeders and matrices, such as Sininho and Belita de Maripá, great champions of the International Fair of Goats and Sheep (FEINCO). The genealogical record of capril of Agro Maripá is realized by CAPRIPAULO (Paulista Association of Goat Breeders) and its milk quantity is measured by the Brazilian Association of Breeders of the Dutch. Our breeders and matrices are currently given special management in every stage of life – maternity, nursery, leisure area, scheduled grazing, recreation, balanced feeding and exclusive housing for breeders. The result is a squad with strict control of sanity, production and animal welfare.